European Football Cup 2015 Ultimately Moved to Budapest! The CONIFA European Football Cup (EFC) 2015, the first ever European Championship of national teams outside FIFA, will be held in Budapest, Hungary. Szekelyföld LE will act as a host and Dr. Kristof Wenczel will act as the head of the new organizing committee working on all details of the tournament. Initially the hosting rights were awarded to the Manx International Football Alliance (MIFA) unanimously by the CONIFA Executive Committee in August 2014. MIFA planned to host the whole tournament in the city of Douglas with 12 invited teams. Unfortunately unforseen travelling issues, especially the limited numbers of ferry tickets directly after the TT Races made it impossible to fit the needs of the teams and the large number of fans wanting to see the matches. In addition financial backing of local companies, investors and government did not materialise as MIFA originally believed. These reasons combined made it difficult to organize and finance a tournament on the Isle of Man alone. However CONIFA and MIFA were approached by different sponsors from England, more precisely Greater London, who were very willing to back and support the tournament. Unfortunately despite several extremely positive meetings in London CONIFA and MIFA were last week informed that this finance would not be available in the short term which was required to meet deposit payments for Stadium hire, hotels, transport etc. For these reasons and the fact that major events on the Island had failed in the past where reliance had been placed on forward selling of tickets MIFA were not willing to risk a situation where the tounament could be cancelled or number of teams reduced at short notice. MIFA requested CONIFA to hold an emergency Executive Committee Meeting to discuss the situation MIFA presented different feasible options to the Committee which were discussed in detail. Unexpectly the CONIFA legal advisor, Dr Kristof Wenczel, who is also the FA president of the Szekely Land FA, offered to host the tournament in Budapest. Of course this alternative was felt to be in the best interest of our members as it had no alteration to the agreed tournament format as suggested by MIFA. All 12 competing teams were then contacted and informed of this proposal. So ultimately the EFC hosting rights were moved to Szekely Land FA unanimously backed by the CONIFA Executive Committee and the participating teams. We all are very thankful for this fantastic offer of Dr Kristof Wenczel and Szekely Land and their courage and determination to accept this challenge in such a short period of time. Even though an EFC in Budapest looks like an emergency plan and was not planned initially we nevertheless can also say that we feel very confident that this tournament will be of the highest standard. Looking into the drafts for the European Football Cup in Budapest 2015 and knowing of the full support of the Hungarian public, government and Football Asscociation, we can expect this tournament to set new standards in many ways. We as CONIFA and every single team is very much looking forward to the tournament and we invite you, our followers and media from all over the world, to follow us on each step to the tournament in June. CONIFA will of course fully support Szekelyföld LE and the local partners in Hungary in every challenge they face and we will publish more detailed news on a regular basis as it becomes available. 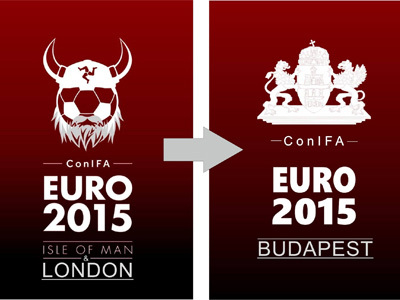 CONIFA is extremely sorry for MIFA and its team Ellan Vannin that the Euros are not taking place on the Isle of Man as originally planned and recognises and applauds the effort and commitment that MIFA always demonstrates towards CONIFA. We also would like to apologise to any supporters of the teams or general public who may now have to alter travel arrangements.